What is an abnormal heart rhythm (arrhythmia)? What causes heart rhythm disorders? What are the different types of heart rhythm disorders? What are the signs and symptoms of heart rhythm disorders? How are heart rhythm disorders diagnosed? What is the treatment for heart rhythm disorders? What is the prognosis for heart rhythm disorders? Can heart rhythm disorders be prevented? When the heart's electrical system malfunctions, the normal rhythm of the heart can be affected. Depending upon the abnormality, the heart may begin to beat too fast, too slow, irregularly, or not at all. Heart rhythm disorders are often referred to as cardiac arrhythmias (cardiac = heart; a = lack of) but this is technically incorrect, since in most cases there is a heart rhythm, but it is abnormal. Cardiac dysrhythmia (dys = abnormal or faulty + rhythm) might be a better term. Dysrhythmias may occur because of problems directly associated with the electrical "wiring," the SA node, the AV node, or ventricular conducting system. The issue may also be due to influences on the conducting system from outside the heart. These can include electrolyte abnormalities in the bloodstream, abnormal hormone levels (for example thyroid function that is too high or too low), and medication or drug ingestions. Any abnormality of the electrical cycle within the heart that generates an abnormal beat, whether it is too fast, too slow, skipped, or irregular is considered a dysrhythmia. Dysrhythmias are usually classified as originating from above the AV node (supraventricular ) or below, from the ventricle. They are either fast, slow, or irregular and persistent or intermittent. The heart is a two-stage electric pump whose job it is to circulate blood through the body. The initial electrical impulse that begins the process of a heartbeat is generated by a group of cells located in the upper chamber of the heart, the atrium. These cells act as an automatic pacemaker, starting the electric signal that spreads along the "wiring" within the heart muscle, allowing a coordinated squeeze so that the pump can function. Blood from the body depleted of oxygen and containing carbon dioxide is collected in the right atrium and then pushed into the right ventricle with a small beat of the upper chamber of the heart. 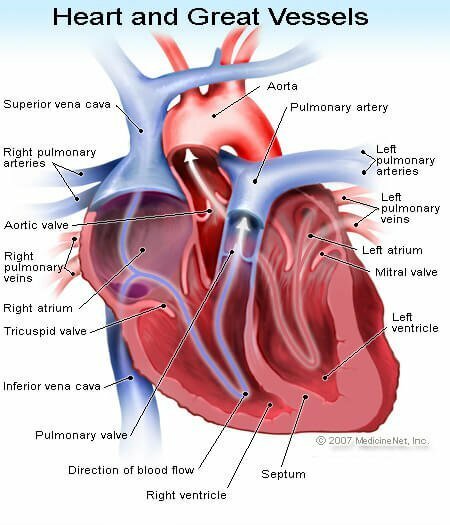 The right ventricle pumps the blood to the lungs to pick up oxygen and release the carbon dioxide. The oxygen-rich blood returns to the left atrium where the small atrial beat pushes it to the left ventricle. The left ventricle is much thicker than the right because it needs to be strong enough to send blood to the entire body. There are special cells in the right atrium called the sinoatrial node (SA node) that generate the first electrical impulse, allowing the heart to beat in a coordinated way. The SA node is considered the "natural pacemaker" of the heart. This pacemaker function begins the electrical impulse, which follows pathways in the atrial walls, almost like wiring, to a junction box between the atrium and ventricle called the atrioventricular node (AV node). This electric signal causes muscle cells in both atria to contract at once. At the AV node, the electric signal waits for a very short time, usually one- to two-tenths of a second, to allow blood pumped from the atria to fill up the ventricles. The signal then passes through electric bundles in the ventricle walls to allow these chambers to contract, again in a coordinated way, and pump blood to the lungs and body. The SA node generates an electric beat about 60 to 80 times a minute, and each should result in a heartbeat. That beat can be felt as an external pulse. After a heartbeat, the muscle cells of the heart need a split second to get ready to beat again, and the electrical system allows a pause for this to happen. Picture of the great vessels of the heart. Picture of the heart's electrical system. The heart and its electrical activity work within a narrow range of normal. Fortunately, the body tends to protect the heart as best as it can. Rhythm disturbances may be normal physiologic responses, but some may be potentially life threatening. Every cell in the heart can act as a pacemaker. A healthy SA node has an intrinsic heart beat generation rate of 60 to 80. 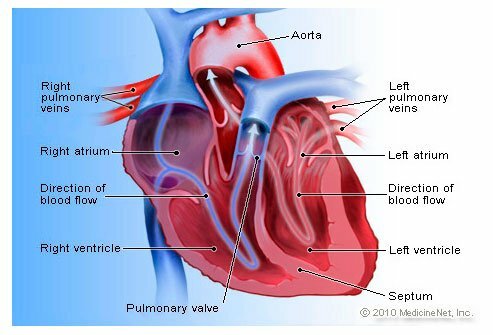 If the atrium fails to generate a heartbeat, then a healthy AV node can do so at a rate of about 40, and if needed, the ventricles themselves can generate heartbeats at a rate of about 20 per minute. This may occur if the cells of the upper chamber fail to generate an electrical impulse or if the electrical signals to the ventricle are blocked. However, these lower rates may be associated with the inability of the heart to pump blood to the body to meet its needs and may result in shortness of breath, chest pain, weakness, or passing out. Non-surgical ablation, used for many types of arrhythmias, is performed in a special lab called the electrophysiology (EP) laboratory. Heart rhythm disturbances may occur because of problems within the heart itself or be the result of abnormalities in the body's environment that can affect the heart's ability to conduct electricity. Cardiac or heart muscle cells become irritated when they are depleted of oxygen. This can occur during a heart attack, in which the coronary arteries, the blood vessels that supply the heart with blood, are blocked. Lack of oxygen can occur when the lungs are unable to extract oxygen from the air. Significant anemia, or low red blood cell count, decreases the oxygen-carrying capacity of the blood and may prevent adequate oxygen delivery. Rapid heart rates may be due to "wiring" problems with the electrical pathways in the heart. This can cause "short circuits" making the heart speed up and beat 150 beats a minute or more. The abnormality can be due to a physical extra electrical pathway such as that seen in Wolff-Parkinson-White (WPW) syndrome, or it can be due to changes in the electrical physiology between a few cells, like in atrial flutter. Rapid heart rates can also occur because of environmental issues that affect the heart. These can be intrinsic to the body, like anemia, abnormal electrolyte levels, or abnormal thyroid hormone levels. They may also be due to reactions to outside influences like caffeine, alcohol, over-the-counter cold remedies, or stimulants such as amphetamines. To the cardiac muscle cell, they all appear to be adrenaline-like substances that can cause cell irritation. Slow dysrhythmias can also be problematic. If the heart beats too slowly, the body may not be able to maintain an adequate blood pressure and supply the body's organs with enough oxygen-rich blood to function. Slow heart rates may be due to aging of the SA node and its inability to generate an electrical pacemaker signal. Often though, it is due to the side effects of medications used to control high blood pressure. Side effects of beta blocker and certain calcium channel blocker drugs include a slowing of the heart rate. Heart rhythm disorders are classified according to where they occur in the heart and how they affect the heartbeat. Because of the heart rhythm abnormality, other symptoms may occur because of decreased cardiac output (the amount of blood that the heart pushes out to meet the body's demand for oxygen and energy). The patient may complain of lightheadedness, weakness, nausea and vomiting, chest pain, and shortness of breath. In critical situations, the patient may fall to the ground or lose consciousness. This may be due to life-threatening dysrhythmias like ventricular fibrillation or ventricular tachycardia. It may be due to heart rates so fast that there isn't enough blood pressure generated to supply the brain with what it needs. The same result can also occur if the heart beats too slowly and insufficient blood pressure is generated. Atrial fibrillation occurs when the atrium has lost the ability to beat in a coordinated fashion. Instead of the SA node generating a single electrical signal, numerous areas of the atrium become irritated and produce electrical impulses. This causes the atrium to jiggle, or fibrillate, instead of beating. The AV node sees all the electrical signals, but because there are so many, and because they are so erratic, only some of the hundreds of signals per minute are passed through to the ventricle. The ventricles then fire irregularly and often very quickly. As in PSVT, the symptoms may include palpitations, lightheadedness, and shortness of breath. The cause of atrial fibrillation, however, may be more significant, since it may be due to aging of the conducting system of the heart and there may be associated atherosclerotic heart disease. Therefore, atrial fibrillation with rapid ventricular response associated with chest pain or shortness of breath may need emergent cardioversion (a procedure that uses electricity to shock the heart back into a normal rhythm) or intravenous medications to control the heart rate. One significant complication of atrial fibrillation is the formation of blood clots along the inside of the heart wall. These clots may break off and travel to different organs in the body (embolize), blocking blood vessels and causing the affected organs to malfunction because of the loss of blood supply. A common complication is a clot traveling to the brain, resulting in a stroke. The treatment of atrial fibrillation depends upon many factors including how long it has been present, what symptoms it causes, and the underlying health of the individual. The patient and his or her doctor will decide whether or not to restore a normal sinus rhythm or to simply keep the heart rate under control. Atrial fibrillation can be a safe rhythm and not life threatening when the rate is controlled. Medications are used to slow the electrical impulses through the AV node, so that the ventricles do not try to capture each signal being produced. The reason to return people to a regular rhythm has to do with cardiac output. In atrial fibrillation, the atria do not beat and pump blood to the ventricles. Instead, blood flows into the ventricles by gravity alone. This lack of atrial kick can decrease the heart's efficiency and cardiac output by 10% to 15%. Blood thinning, or anticoagulation, may be recommended for those patients with atrial fibrillation and elevated risk for stroke. Oral drugs that anticoagulate are warfarin (Coumadin), dabigatran (Pradaxa), rivaroxaban (Xarelto), and apixaban (Eliquis). There are other injectable drugs that are used in a hospital setting. If the patient is at low risk, the doctor may recommend aspirin alone for stroke prevention. If atrial fibrillation is poorly tolerated due to symptomatic palpitations or symptoms of reduced cardiac output, or if there are concerns with lifelong anticoagulation therapy, more definitive therapy may include specific medications, electrical cardioversion, or catheter based ablation (sometimes with a pacemaker inserted). Atrial fibrillation is a common condition, with many implications, and the best plan for each patient should be discussed at length with one's physician. Atrial flutter is similar to atrial fibrillation except that instead of having chaotic electrical firing from all points in the atrium, one point has become irritated and can fire 300 times per minute or more. Many issues that exist for atrial fibrillation apply to atrial flutter. Atrial flutter may degenerate into atrial fibrillation, and the two can often coexist. The heart, its cells, and its electricity may come under the many outside influences causing it to beat more slowly. Sinus bradycardia (brady = slow + cardia = heart) by definition, is a heartbeat generated by the SA node at a rate slower than 60 beats per minute. This may be normal in people who are active and athletic or in patients taking medications designed to slow the heart such as beta blockers and some calcium channel blockers. Vasovagal syncope is an episode of profound sinus bradycardia associated with a noxious stimulus that causes the vagal system of the body to kick in and slow the heart rate. While the sympathetic system of the body is mediated by adrenaline, the parasympathetic system is mediated by the vagus nerve and the chemical acetylcholine, which promotes the exact opposite body reaction than adrenaline. In some people, exposure to pain or a difficult emotional situation can stimulate the vagus nerve, slow the heart, and dilate blood vessels (veins), causing cardiac output to decrease and making a person feel lightheaded or faint. The vagus nerve also can be stimulated to slow the heart when one bears down to urinate (micturition syncope) or have a bowel movement. Rapid heart rates can originate from either the atrium or the ventricle, but rhythms from the ventricle are more often life threatening. The initial approach to rapid heart rates is to quickly identify the rhythm, and if blood pressure is maintained and there is no evidence of a failing heart, then treatment is directed to rate control with the eventual return of the heart back to normal sinus rhythm. If, however, there is evidence that the heart is failing because of the rapid rate, then emergency measures, including using electricity to shock the heart back into a regular rhythm, may be necessary. The heart, its cells, and its electricity may come under many outside influences that may cause it to beat more quickly. Sinus tachycardia (sinus = from the SA node + tachy = rapid + cardia = heart), or a rapid regular heartbeat, is a common rhythm issue. It occurs when the body signals the heart to pump more blood, or when the electrical system is stimulated by chemicals. The body needs increased cardiac output in times of physiologic stress. Cardiac output is the amount of blood the heart pumps in the course of 1 minute. It can be calculated by the amount of blood that the heart pumps with each beat (stroke volume) multiplied by the heart rate. in cases of acute bleeding that may occur after trauma. The electrical system can be stimulated in a variety of ways to make the heart beat faster. In times of stress, the body generates cortisol and adrenaline, causing an increased heart rate in addition to other changes in the body. Think of being frightened and feeling your heart race. Increased thyroid hormone levels in the body can also cause a tachycardia. Ingestion of a variety of drugs can also cause the heart to race, including caffeine, alcohol, and over-the-counter cold medications that include chemicals such as phenylephrine and pseudoephedrine. These compounds are metabolized by the body and act like an adrenaline stimulus to the heart. Illegal drugs such as methamphetamine and cocaine can also cause a sinus tachycardia. Ventricular fibrillation is technically not a rapid heart rhythm because the heart ceases to beat. In ventricular fibrillation, the ventricles do not have a coordinated electrical pattern and the ventricles, instead of beating, just jiggle, or fibrillate. Since the heart doesn't beat, blood is not circulated to the body or brain and all bodily functions stop. Without a coordinated impulse to signal the ventricle to beat, sudden cardiac death occurs. The treatment for V-fib is defibrillation with an electrical shock. Automated external defibrillators (AEDs) in public places have helped decrease the mortality from sudden cardiac death, but prevention remains the mainstay to survive this event. Some people, such as those with a very weak heart muscle or who have a prior history of ventricular fibrillation will require an implantable defibrillator to prevent future episodes of sudden death and treat this rhythm. This rhythm is often associated with a heart attack in which the heart muscle doesn't get enough blood supply (myocardial ischemia), becomes irritated, and causes secondary irritation of the electrical system. Aside from myocardial ischemia, other causes of ventricular fibrillation may include severe weakness of the heart muscle (cardiomyopathy), electrolyte disturbances, drug overdose, and poisoning. Ventricular tachycardia is another rapid heart rate that originates in the ventricle. The causes are the same as those for ventricular fibrillation, but because of the electrical conduction pattern in the heart pathways, an organized signal is provided to the ventricles, potentially allowing them to beat. This remains an emergency, since V-tach may degenerate into ventricular fibrillation. Every person experiences the occasional palpitation in which the atrium or the ventricle beats early. These premature atrial contractions (PACs) or premature ventricular contractions (PVCs) are normal variants and most people are unaware of their occurrence. However, some patients report a palpitation in the chest and neck, often described as a "thump" or "thud." PACs and PVCs in otherwise healthy individuals do not pose any health risks. Paroxysmal supraventricular tachycardia (PSVT) occurs when the pathways in the AV node or atrium allow an altered conduction of electricity, and the atrium begins firing in a fast but regular rate, sometimes more than 150 to 200 times per minute. The ventricles, sensing the electrical activity coming through the AV node, try to beat along with each electrical impulse and PSVT occurs. This is rarely a life-threatening event, but people may feel uncomfortable when PSVT occurs. They may become lightheaded, weak, have shortness of breath, and describe a feeling of fullness in the throat. PSVT may also be tolerated and may stop on its own. If this is a first time event, activating EMS (emergency medical services) and calling 9-1-1 is important, since other tachycardias can be life threatening. The treatment for PSVT includes attempts to stimulate the vagus nerve to slow the heart (see vasovagal syncope above) by holding one's breath and bearing down as if to have a bowel movement. Intravenous medications are often used to interrupt the episode. Many patients have PSVT due to congenital abnormalities in the electrical conduction system of the heart. External causes can include hyperthyroidism, electrolyte imbalances, and the use of caffeine, alcohol, over-the-counter cold medications containing stimulants, or illegal drugs like cocaine and methamphetamine. Wolff-Parkinson-White syndrome is a specific type of PSVT, in which an inborn error of wiring has occurred near the AV node, and an accessory electrical pathway exists. The diagnosis is made by electrocardiogram (EKG) or electrophysiologic testing, and the treatment may include medication or destruction of the accessory electrical pathway by invasive catheter ablation. Aside from medications that are meant to slow the heart for treatment of a variety of medical problems, bradycardia (brady = low + cardia = heart) is usually due to heart block and the aging of the electrical wiring of the heart. This is no different than the aging of your home's electrical system; but instead of being able to rewire the heart, these conditions may need to be treated with an implantable pacemaker. Heart blocks involving the ventricle may be asymptomatic and of little consequence except to point to underlying heart or lung disease. They are diagnosed by EKG. Heart blocks involving the atrium can be classified as first-, second-, and third-degree. First-degree heart block is common and usually of little significance. There is a slight delay in getting the electrical signal from the SA node to the AV node, but the heart functions normally. There are two types of second-degree heart block (Mobitz I and Mobitz II, with Type II being more serious than Type I.
Third-degree heart block describes the complete loss of connection between the electrical activity of the atria and the ventricles. Second- and third-degree heart blocks are diagnosed by analyzing heart rhythm strips and EKGs. Heart blocks are symptomatic because the heart beats so slowly that cardiac output is decreased. The symptoms may include lightheadedness or passing out (syncope), weakness, shortness of breath, and chest pain. Diagnosis and treatment of life-threatening heart block happen at the same time. Often, the patient with bradycardia may be taking medications that can slow the heart including beta blockers and certain calcium channel blockers. If the patient is stable, time can be taken to have the medications wear off while the patient is monitored. If the bradycardia remains, a pacemaker may be needed. In certain situations, a temporary pacemaker can be placed to stabilize the patient, while decisions are made as to a permanent solution. Unexplained palpitations are not normal, especially when associated with shortness of breath, sweating, feelings of chest pressure, or passing out. The person should be made comfortable and laid flat, and EMS (emergency medical service) should be activated by calling 9-1-1 or the emergency number in your area. If the person is unconscious or unresponsive, Basic life support (American Heart Association) should be initiated. Call 9-1-1, get an AED, and decide whether CPR should be initiated. If the episode is short-lived and resolves spontaneously, the primary care professional should be contacted urgently to seek advice. If the episode is a recurrent problem, the diagnosis is known, and the rhythm disturbance resolves itself, then a less urgent call to the primary care professional is warranted. It is reasonable to seek emergent medical care any time that a heart rhythm disturbance occurs or if there is concern that a heart problem is present. The mainstay of diagnosis remains the EKG and heart rhythm monitoring. These are often done immediately in the ambulance or upon arrival in the emergency department. In many patients, the palpitations or symptoms may have resolved, and no acute rhythm abnormalities can be found. Depending on the associated symptoms and the history, observation and monitoring of the heart may occur in hospital or as an outpatient. In patients who have passed out, admission to the hospital often occurs. Those patients with chest pain and shortness of breath may also be admitted to evaluate their heart. In patients who are not admitted, a heart monitoring device may be placed to monitor the rhythm for a duration of time. Monitors may be worn for 24 hours or up to 1 month. In some instances, rhythm identification is elusive and may take months or years to capture and identify. Implantable cardiac monitors may be placed for periods greater than 1 year. If the rhythm is known, then tests to identify potential causes may be done. These are dependent on the specific rhythm abnormality and can range from blood tests to lung evaluations and sleep studies to echocardiograms and electrophysiologic testing. There is no one treatment for a heart rhythm abnormality. When the patient is unstable, with no pulse or blood pressure, or when they are unconscious, American Heart Association guidelines are available to direct care to hopefully restore the heart rhythm to normal and return a pulse. For V-fib and V-tach, electricity may be the most important drug, and the heart is shocked back into a heart rhythm, hopefully compatible with life. Other common medications used in crises situations depend upon the life-threatening rhythm and may include epinephrine (adrenalin), atropine, and amiodarone. For patients with supraventricular tachycardia (SVT), the goal is not only to slow down the heart rate but also to identify which rhythm is present. Vasovagal maneuvers, like holding one's breath and bearing down as if to have a bowel movement may resolve the situation, or it may slow the rate temporarily to make the diagnosis. Adenosine can be injected and may convert SVT to normal sinus rhythm by slowing the electrical impulse at the AV node. It can also be used as a diagnostic challenge to help identify atrial fibrillation or atrial flutter with rapid ventricular response. For atrial fibrillation with rapid ventricular response, the initial goal is to slow the rate and maintain normal blood pressure. Calcium channel clockers like diltiazem and beta blockers like metoprolol may be used intravenously to control rate. Digoxin is a second-line medication that may be helpful when first-line medications fail. In unstable patients, with chest pain, shortness of breath, or decreased consciousness, cardioversion with an electric shock may be required. The decision to electively convert A-fib to normal sinus rhythm depends upon the patient and situation and is often a decision left to the primary care professional. The question regarding anticoagulation also will need to be addressed. While most heart dysrhythmias can be treated and controlled, ventricular fibrillation or tachycardia can be fatal. Their recognition and treatment are true emergencies, and there is no guarantee that sudden cardiac death can be reversed. For all other rhythm abnormalities, there may be time to make the diagnosis and design a treatment plan. The goal is to minimize the effect that the dysrhythmia has on daily activity and quality of life. Minimizing risk factors for heart disease will be helpful, including controlling blood pressure, lowering cholesterol, keeping diabetes under control, and not smoking. For those with rapid palpitations that are intermittent, avoiding stimulants like alcohol, caffeine, over-the-counter cold medications, and illicit drugs are important preventive measures. Mann, D. L., et al. Braunwalds Heart Disease: A Textbook of Cardiovascular Medicine. 10th edition: Saunders, 2014. "2010 American Heart Association Guidelines for Cardiopulmonary Resuscitation and Emergency Cardiovascular Care Science." Circulation 122.18 suppl 3 (2010):S640-S946. What is atrial fibrillation? Learn atrial fibrillation (A-fib) treatment, symptoms, guidelines, and ablation. 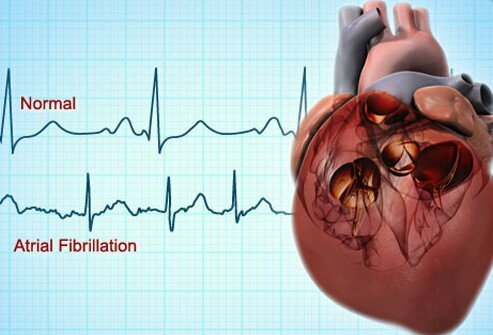 What causes atrial fibrillation? Please describe what type of heart rhythm disorder you have. How was your heart rhythm disorder treated? How was your heart rhythm disorders diagnosed? What symptoms do you experience with your heart rhythm disorder? How do you manage your atrial fibrillation? Atrial fibrillation is the most common type of abnormal heart rhythm. Atrial fibrillation or AF can lead to serious heart complications like stroke. Risks associated with AFib are related to heart rhythm changes. Treating atrial fibrillation addresses these changes in heartbeat. A pacemaker is a device or system that sends electrical impulses to the heart in order to set the heart rhythm. A pacemaker can be a natural pacemaker of the heart (the sinoatrial node) or it can be an electronic device that serves as an artificial pacemaker. The treatment of pulmonary edema depends on the cause of the condition.